The focus of the negotiation was on the developing of the new agreement on climate change that is to be finished until the end of 2015 according to the decision of the international UN conference in Durban, South Africa in December 2011, and will come into force from 2020. Prior to this, all countries need to undertake some actions to reduce emissions. After termination of the first period of the Kyoto Protocol (December 2012) there will be substantially less international mechanisms to stimulate low-carbon projects available for the countries that did not join KP 2, including Russia. A press release from the WWF (Russia) noted that during two weeks the countries have been negotiating in five subsidiary bodies of the Framework Convention on Climate Change (UNFCCC) in order to prepare draft decisions for the next UN conference on climate, which will be held in the Qatar capital, Doha in November-December 2012. “All what was done is ridiculously little – an agenda for future work was accepted and nothing more. But is not that simple, "- says Alexey Kokorin, head of the Climate and Energy program of WWF Russia, - "Advanced countries have been able to defend the two positions." Firstly, all attempts to keep in the new agreement completely outdated division of the countries into two groups according to UNFCCC was rejected. The agreement must be equal for all, although the numerical parameters, of course, will be different. Secondly, the countries divided the work of Durban in two parts: development of the new agreement and actions of the countries to reduce emissions, both before and after 2020. "Roughly speaking, the text of the agreement and its appendix – a table with commitments to reduce emissions – will be prepared separately but in the same time. Particular attention to the emissions is no accident, so weak are the obligations of the majority of developed countries so far and so uncertain are the parameters of controlling and reducing of the emissions in the largest developing countries, and in fact they provide the lion's share of global emissions growth," – says Alexei Kokorin. In parallel with the discussion of these conceptual issues, a work on the negotiations on a number of technical solutions was going on. The documents regulating the monitoring of forests in tropical countries and appropriate reporting and verification procedures were prepared as well as documents for creation of the national adaptation plans in the developing countries. Equally important for our country was a paper on climate education, according to which the financial support of the relevant actions can be received by all countries, including Russia. Now all these documents will proceed to the UN Conference in Doha. 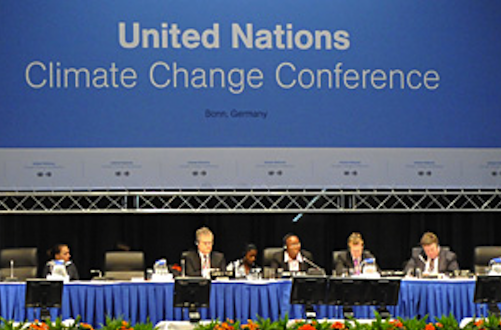 Actively discussed in Bonn and The second commitment period under the Kyoto Protocol which, according to the decisions of Durban, is due to begin in 2013 was also actively discussed. Nothing new has happened here. "Kyoto-2 transforms into a very limited mechanism for economic cooperation between Western and Eastern Europe and developing countries. Refusal of other developed countries to participate in it is no surprising, Kyoto-2 promises them more losses than acquisitions," – commented Alexei Kokorin. "But the reasons for Russia’s refusal of Kyoto-2 were unclear for the negotiators, since for Russia it is clearly cost-effective. Nobody is going to lure Russia into the Kyoto-2, on the contrary, we have many rivals. But maybe we should ourselves take care of our projects under Kyoto Protocol, that will no longer receive an international funding next year."